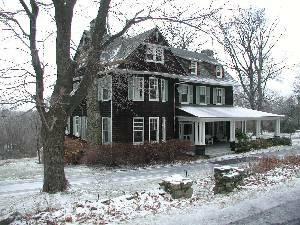 Enjoy the luxury and serene Blue Ridge Summit mountain area in our all-season vacation rental house close to the Ski Liberty Mountain Resort and Camp David and 20 minutes from Whitetail mountain, a turn of the century Maryland Victorian house in Cascade, Maryland, on Rowland Hill. This stately 5 bedroom, 2½ bath, later-style Victorian home was built in 1910. 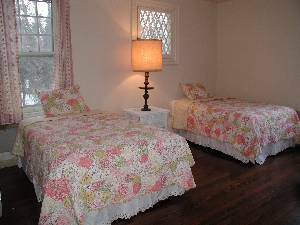 It is historic, and has been recently renovated with modern amenities. We rent this home to nature, ski, or history enthusiasts. In addition to the nearby mountains and areas for skiing, hand gliding, hiking, golfing, biking, fishing, canoeing, and sight seeing, there are multiple historic areas to visit. If nature is what you like, it does not get any better than this. If you are a skier, the Liberty Mountain Resort is only 7 miles away in Pennsylvania. 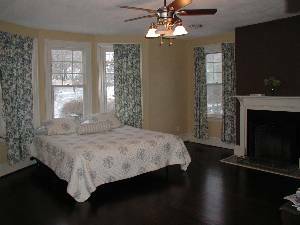 This home is also close to Cunningham Falls Maryland State Lake and Park (5,000 acres of parkland), Catoctin Mountain National Park (25 miles of hiking trails), Penn Mar State Park, and is just minutes from the home of the Presidential Retreat, Camp David. The countryside and mountain views in this area are outstanding. Stay in one of the most rustic, mountain areas of the east coast, just one hour from the DC and Baltimore areas. If nature is not what you are looking for, there are also shopping centers, antique shops, and movie theaters nearby. You can also sightsee at places like Emmitsburg, Gettysburg, Harper’s Ferry, or one of many other Civil War locations, sich as Battle of Monterey historic sites nearby. The spacious 5 bedrooms accommodate 12 persons very comfortably. There is also a pull out couch in living room. This house is a fabulous getaway all year round. 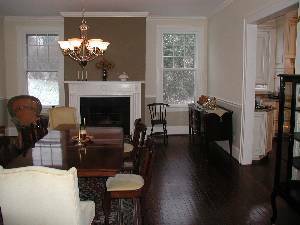 Enjoy the cozy fireplace atmosphere during the Fall and Winter and relax in the wicker furniture and wrap around porch in the Spring and Summer. Both bathrooms on the second floor have claw foot tubs, one has a shower enclosure. Enjoy the serene and private environment with almost 2 peaceful, secluded acres. This home is also great for entertaining. On the first floor, it boasts a brand new gourmet kitchen with new cabinets, granite counters, and modern amenities, a brand new half bathroom with marble floor, in addition to the very large living room and dining room with Arts and Crafts style windows and newly finished mahogany hardwood floors throughout the first and second floor. This home is well situated off the beaten path, ½ mile off Route 550 on Rowland Hill Road. Pennsylvania is only steps away from Route 550 up the mountain. The town of Cascade is close by with a local grocery store to serve your needs. Several restaurants, including a newly opened Blue Ridge Summit Lodge, (1 mile away in Pennsylvania) and The Carriage House in Emmitsburg, Maryland (9 miles away), and several restaurants in Frederick (20 minutes away) offer the finest menus in the area. 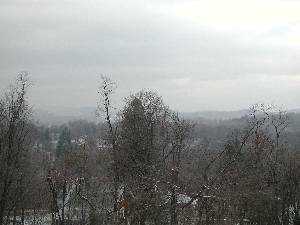 The Blue Ridge Summit mountain area has been, and still is, a common vacation area and get away of persons/families wanting a getaway from the Washington/Baltimore and other city areas. Presidents since Dwight Eisenhower have vacationed near this house, at Camp David, and families have vacationed in the Blue Ridge Summit area for decades. If you are looking for a back to nature, weekend get away, a retreat or out of town event, a week’s vacation or a month if needed, give us a call. We will attempt to accommodate your needs. This is a perfect retreat for one or more families or for those who want a getaway. We are about an hour from the DC and Baltimore areas, and only 20 minutes north from Frederick, Maryland and east (6 minutes) of Waynesboro, Pennsylvania and southeast (20 minutes) of Gettysburg, Pennsylvania. Newly renovated kitchen with granite counters, custom cabinets, sky lights, wine cooler. Shopping, Restaurants, Cinemas, Museums, Sightseeing, Antiquing, and Swimming Nearby. Beautiful Country Victorian Estate, in private peaceful setting, near Ski Liberty and Blue Ridge Summit Mountain. 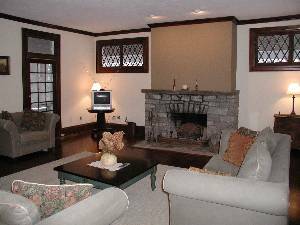 Very large and cozy family room with fireplace and television. Emjoy enteraining in this beautiful dining room, with cozy fire place. Seats 8, plus extra side table seats 4. 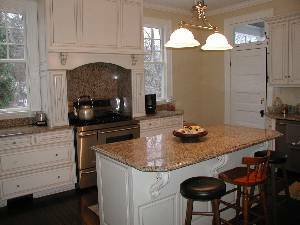 This kitchen was recently updated, with new granite counters, custom cabinets, wine cooler, and fancy oven and propane stove top. The master bedroom has a beautiful front view. Lots of space. This room also has a toddler bed. A cute and cozy bedrrom. Not shown is a large guest room (with 2 Fulls), as well as a 5th bedroom (with 1 Full and 2 twins). The overlook from the back of home has a mountain top view. This vacation rental was the best we have ever had. 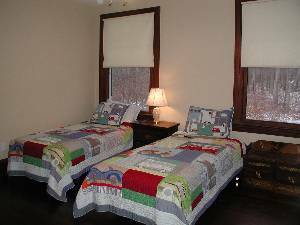 We have stayed many places in Pa.
Rates are for up to 5 guests. Add an additional $100 for each additional person per visit, max up to 12 guests. * The best rates are the non-holiday weekly rates. They generally are from Monday to Thursday, depending upon availability. **Holidays include Dec. 24-30, Jan1, Jan13-15, Feb. 17-19, Labor day weekend, Mem Day weekend, Thanksgiving weekend, etc. Must be at least 25 years/older to rent. Deposit: A $300.00 refundable security deposit is required with reservation, and full payment must be received within 2 weeks prior to stay, or as per agreement. Cancellations and Refunds: Forfeit deposit if cancellation is received less than 2 weeks in advance of planned arrival.